I knew my daughter and her friends were awesome, but I had no idea just how awesome until today. Devon, my 20-year-old awesome girl who happens to have Down Syndrome, goes to Highline College as part of the Achieve program. The Achieve program is a post high school education program for people with intellectual/developmental disabilities. Devon rides her bike 2 miles to the light rail, rides the light rail for 40 minutes then takes a bus 15 minutes, each way, every day, totaling about 90 minutes. She tripped running to get across the street last Tuesday trying to catch the light rail breaking her ankle. She didn’t know her ankle was broken, but she was with her so called “disabled friends” who made sure she was safe, and helped her get all of the way home and got a hold of my wife to make sure she didn’t have to try to ride her bike home. They were a platoon of friends who knew exactly what to do, elevation, ice, help, who to call, they were even prepared to call an ambulance. I was so impressed with how her friends had come to assistance. I think most people would give anything to have friends like that. Nobody lost their cool, I just couldn’t get over it. Devon then had an increasingly tough week, finding out that her ankle was broken and she couldn’t play soccer of even walk on it for at least a month. The week continued to get worse as she woke up with calf pain and developed a blood clot which kept us in the emergency room all day and she is now on blood thinners. After all of that, it is now only Monday of the following week and she has class. So what does she want to do? Go to school! Seriously she wants to go to school. Not only that but she wanted to try her usual route to see if she could do it. This is her last quarter, if she can finish she will be done and she doesn’t want to give that up. After much consternation my wife and I agree that I will go with her to see if it is even doable. I have not done the entire commute with her and I can help her bail if things go south. I also thought I could help problem solve to see if this was going to work or if she was done for the quarter. Sue dropped us off at the light rail (even we thought the bike with a cast was a bit much) and we began our Journey. It was awkward getting on the light rail but was set up to allow wheel chairs and bikes so it really went pretty well. Then a part I didn’t realize, she has to get off the rail and walk a block, or now scooter/crutch a block, and wait for the bus after crossing two four-lane busy streets. The bus lowers a ramp and the bus driver kicks people out of the disability seating so Devon can board. The hardest part was her college campus (after walking a block from the last bus stop) nestled in a Seattle hillside, Highline College is frankly not very accommodating to people with physical disabilities. Here is where the journey gets even more interesting, Highline isn’t exactly small, but we don’t go anywhere where someone doesn’t give Devon a shout out and help us to the safest route. The access people from the college gave us directions to the safest route utilizing an elevator. However, the elevator was broken and the college staff had no idea what we should do. So who should help but one of Devon’s friends who happens to use a wheelchair, that tells us about the safest way and that the elevator has been broken for a while. Dotted along our route are people saying hey and can they help. We finally make it to lunch as I brought a good book and get caught up on some nice reading while she is in her classes. Now I am observing Devon at college with her friends all of whom are volunteering to help and discussing their classes, work, you know, normal young adult stuff. After lunch its time to go home and I am dreading this trip home. It frankly sucked, not because I am helping Devon, it just sucked. I am writing this because I am so humbled. First, that these kids do this every day without complaining, ever. It’s not just Devon, but at least 6 of her friends that make similar commutes. 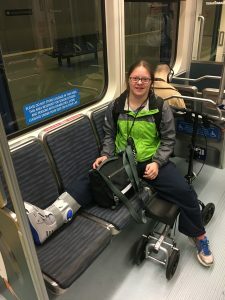 Second, trying to navigate the world in a wheelchair is possible, but it is so hard I really thought I knew, but man, doing a commute like that with a physical disability (which a lot of people do) it takes a whole different kind of fortitude. Lastly, friends, oh man, OMG I don’t know how many people have friends like that, but I hope everyone does, because how the heck do we get through life without that. You also have to know, that all these kids Devon knows are kids/young adults that she has just known the last few years. That is just who they are, genuine people who mean what the say, know right from wrong. They live their lives as they think they should with no ulterior motives. I am so humbled and hopeful for the future of our world knowing that there are souls like this out there.